Studying. It’s a task we all loathe, and one I haven’t done enough of since starting Year 4, having been distracted by endless administrative tasks, social affairs, and my own desire to enjoy my “settling back in” phase. However, now that the penultimate month of November is already upon us, there is now doubt that I must somehow coax myself back into the life of the diligent, studious student, and away from being the life of the party. Or at least, I should stop watching the party from afar and pretending I was invited. (Some people have a life, other people run blogs). But, whilst I may be ready to return to a life of full-on studying, I’m not quite ready to return to weekends at the library, and the boring, cold-lunches that come with them. It dawned on me that a good way to break the mould, refresh my motivation and get an occasional change of scenery would be to turn to the “coffee” section of my cuisine-campaign map. As an avid coffee-enthusiast, I’m eager to explore more of London’s purist, independent coffee shops this year, and the only real way to find the time to visit them in the midst of my busy schedule would be to occasionally set up camp in the sit-in cafes that cater to London’s busy workaholics. 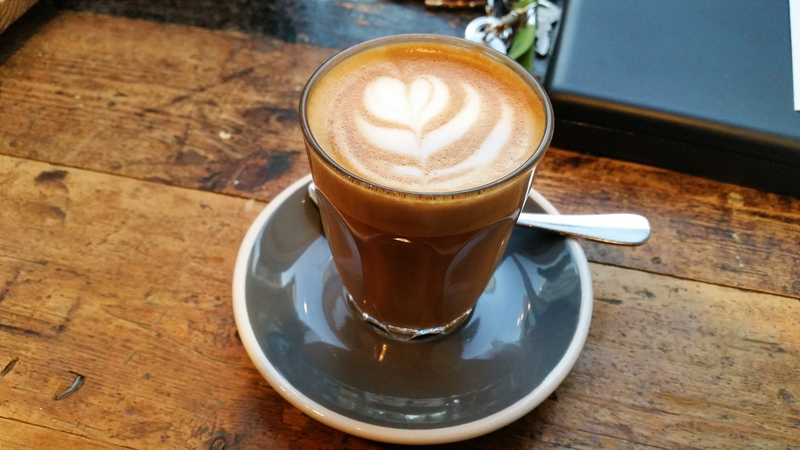 The maiden voyage of my coffee-camping expedition would see me set up a temporary base of operations at Timberyard in Seven Dials, and after narrowly claiming a seat in the busy Saturday bustle, I began my day with a flat white. Based on the popular “Climpson Estate” blend, the resulting cup was a divine work of wonder. The delicate, velvety layer of microfoam broke away to reveal a full and deep body of espresso and steamed milk, both of which had engaged each other in complete harmony. Its smooth, sweet and uniform tone swelled in the mouth, before breaking away into a mellow sharpness as soon as it hit the tongue, releasing exquisite notes of orange, chocolate and caramel. Such divine character can only come from the expert formulation of a skilled barista, or just pure fluke-filled luck. Whichever of the two it was on this occasion, I cannot say, but either way, it left me with very few points of criticism, and as a very critical individual, I’m not sure I approve of that. Timberyard: 1, Teeth: 0. Four productive hours passed by, and despite running on sufficient brain power from my first cup, I decided to treat myself to a “Jabberwocky” based cortado. Named after the famous “nonsense-poem” in “Alice’s Adventures in Wonderland”, this Costa-Rican-Nicaraguan-Rwandan blend has a much more tangible presence than its namesake. With a lighter bitterness and a more delicate tone than the Climpson Estate, it resulted in a soothing and balanced cortado. As you walk into Timberyard, the first thing that greets your eye is a counter full of guilty treats that would make even the most toughest of personal trainers weep uncontrollably. Everything from cronuts and pastries to an assortment of bakes and cakes lie at your disposal, and the temptation to indulge engulfs your senses. Having already had a day of indulgence the day before, I was strangely not in the mood for more sweet treats (blasphemy I know), and so, looked out for a fruity granola pot. Alas, the closest item they had on the day was a chia pot, infused with a concoction of raspberry and orange juice, and topped with coconut and blueberries. 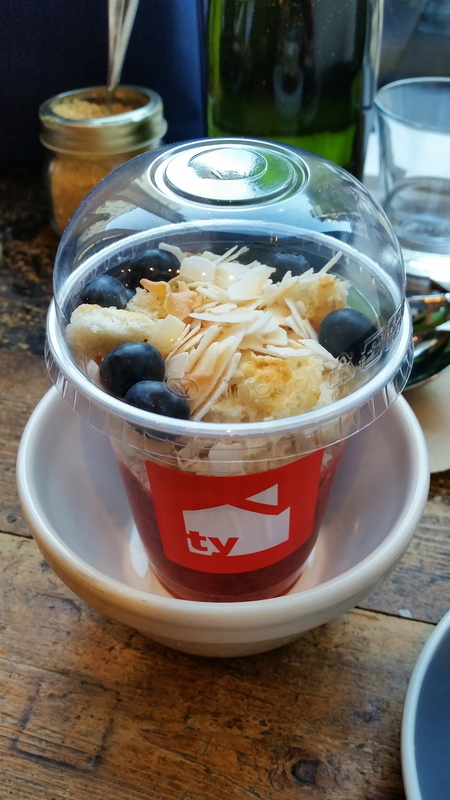 The raspberry and orange juice blend delivered a sharp, citrus tang, which contrasted and combined well with the firm, chewy textures of the coconut shreds and coconut flakes, and the softer texture of the coconut sponge pieces shredded within. Ultimately, the orange juice took dominance in terms of flavour, and it was certainly a very odd, but pleasant fruity-breakfast creation. After reading up on a spot of Orthodontics, I built up an adequate appetite for lunch. Well, it was either that, or my tendency to crave food when I’m bored out of my mind. (Just kidding Orthodontists). Looking over the selection of sandwiches on display for the day, the only “halal” / non-meat options I had were cheddar, rocket and tomatoes, or smoked haddock and rarebit. Now of course, food isn’t food if there’s no animal in it, so I opted for a toasted version of the latter. The sandwich consisted of high quality bread which possessed a firm, crusty and crunchy texture. This contrasted incredibly well with the soft, sticky texture of the rarebit, the soft, moist texture of the haddock fillet, and the fresh, crunchy texture of the vegetation within. 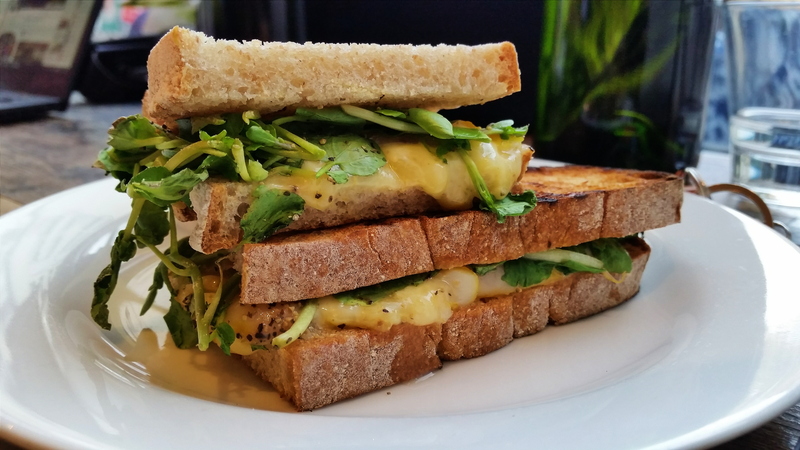 The haddock was empowered with flavour from the rich, mature cheese and mild mustard that made up the rarebit, and the whole sandwich delivered a wonderfully soft and mellow touch to the tastebuds. I think this is a heart. A slightly deformed heart that’s burnt around the edges. Like mine. My regular flat white cost £2.80, whilst the cortado came in at £2.60, the chia pot at £4.20, and the sandwich at £6.60. Generally, coffees and teas range from £2-£3, with a few pricier options (i.e a two-cup filter brew for £6), whilst sweet treats range from £3-£4, and sandwiches and quiches from £4-£6. Whilst the sandwiches are rather steep in price, it’s worth bearing in mind that the cafe is right in the midst of central London, and the quality of the components are relatively high. The coffees, teas and sweet treats are otherwise very reasonably priced, and in line with what you’d expect at any other independent coffee shop. 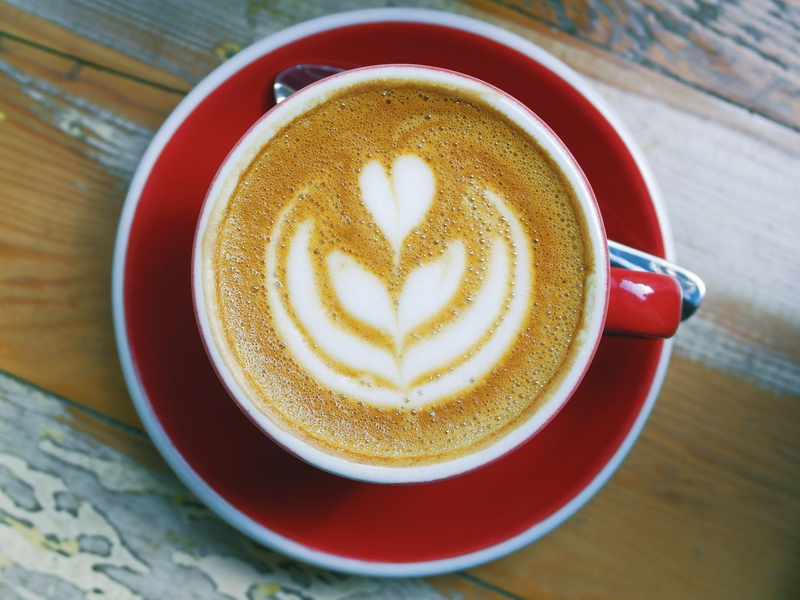 Particular credit has to be given to the coffees themselves, which seem to be brewed with care and attention from start to finish, and are certainly worth every penny. The staff at Timberyard are warm, welcoming and extremely helpful. If sitting in, your order will be brought to you promptly after ordering, and taken away again once a patrolling staff member catches a glimpse of your empty, dry mug. (The one that your coffee was served in, not your face). Whether you’re working, reading or simply chilling out, this allows you to carry on doing what you’re doing in peace, without having to lift much of a finger. (Mothers who spoil their children would be furious at this clear invasion of their turf). This quick and efficient display of service feels very constructive to productivity, and creates a warm sense of welcome. Timberyard Seven Dials is quite simply a credit to the versatility that so many of London’s cramped up coffee shops lack. Comfortable sofas sit in a circle in the centre of the ground floor – ideal for the casual book-reader, whilst wooden tables and window-sills serve the busy-bee workers and casual drinkers. There is also a basement full of “meeting rooms”, which can be booked out for a tidy sum. When not in use, they simply serve as extra seating space, so head downstairs if the ground floor is packed out. The venue overall is attractive and cosy, with a mishmash of assorted furniture and decorative pieces, and the entire set-up carries a simple, yet graceful composure. The cafe itself is a quick five to ten minute walk from Covent Garden station, and public transport is advised. The bustle and buzz of Covent Garden spills ever so neatly through the doors of Timberyard Seven Dials. Amongst the relatively quiet backdrop of conversation, a mixture of upbeat and mellow music plays in the background, and these two elements come together to create an extremely leisurely ambience, which once again, seems fitting and suitable for every type of coffee-shop patron. Whilst others conversed in leisure or read their novels, myself and a few other worker-bees buzzed on undisturbed. I managed to obtain a productive five to six hours of work during my stay, unaffected by the vibrant sounds, smells and sights around me. It was certainly a pleasant change from the dull and dusty library, and the best thing is that I left Timberyard with a simultaneous sense of accomplishment, and enjoyment. If I can have fun whilst studying here, I’m certain you can really enjoy yourself in leisure. When I picture a “true coffee shop”, I picture a versatile den that is tailored to all manner of true coffee-enthusiasts, and the wide array of intents and purposes that each one may have. For me, a truly special coffee shop is a hub of creativity and productivity, of business and of pleasure, of work and of play, and of rest and relaxation. A place to innovate, catch up with old friends, soothe the sorrows of modern life, and simply reflect, relax, and celebrate in the warmth of a divine brew. Whilst London is filled with “coffee shops”, there are very few that manage to create the “true coffee shop” feeling. With fantastically-constructed coffee and food, a wonderfully quaint and welcoming venue, friendly staff and an extraordinary ambience, Timberyard’s Seven Dials branch is a true testament to the concept of a quintessential coffee shop.